Tagline: The science of discovery is the principle of uncertainty. Story: Imagine a universe governed by the principle laws of uncertainty where reality is only a momentary state. A dimension far beyond our present known fabric of time and space where the impossible were possible; and the past, present and future merely emergent properties of consciousness. And what if we could stream that consciousness from one parallel reality to another? Or does simply asking the question create its own paradox? Why does time move only in one direction? And how do you chop the head from a cat which has no body, and only smiles? 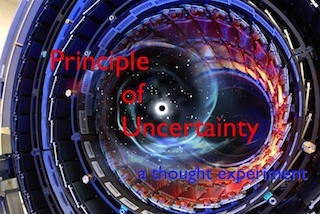 About: PRINCIPLE OF UNCERTAINTY is a thought-provoking original script that stands out for its scientific and philosophical notions. Comparisons to Waking Life and Cloud Atlas could be made. A fascinating and gripping script full of intriguing scientific concepts, deep philosophical notions and stirring human moments.